The countdown for long-awaited youth-centric annual “Joy Bangla Concert” is nearing an end as the largest musical extravaganza is set to take place at the Bangladesh Army Stadium here this afternoon. 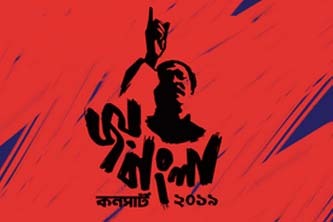 The concert is going to be staged on a red-letter day when the nation is observing the historic 7th March commemorating the landmark speech by Bangabandhu Sheikh Mujibur Rahman which was touted as indirect declaration of the country’s independence in 1971. Under the supervision of Centre for Research and Information (CRI), Young Bangla, one of the leading youth networks of Bangladesh, hosts the mega event annually to revive Liberation War spirit among youths. At the concert, leading musical bands perform one song each from the list of patriotic songs played from the Shadhin Bangla Betar Kendra, the rebel radio station that kept up the morale of the freedom fighters and also the countrymen in 1971 Liberation War. “The Young Bangla has been organising the concert every year since 2015. The celebration has now become more significant as the UNESCO has recognised the landmark speech of Bangabandhu as a world documentary heritage on October 30, 2017,” CRI Associate Coordinator Engineer Tonmoy Ahmed told BSS on Wednesday. He said leading bands Artcell, Chirkutt, Lalon, Arbovirus, Shunno, Nemesis, Cryptic Fate and Bay of Bengal will perform in the concert to mesmerize the fans with rock music. The entry to the mega event at the Army Stadium is totally free this year as the spectators’ just need to complete registration, Ahmed added. This year entry gates will open at 01:30 pm today while there will be a separate entry point at the venue for female audiences, Ahmed said. Hundreds of youths imbued with Liberation War spirit will gather at the stadium to recall the day and celebrate independence with the Bangla rock music.